The 5th Dimension is an American popular music vocal group, whose repertoire also includes pop, R&B, soul, and jazz. Originally known as The Hi-Fi’s,the 5th Dimension changed its name in late 1966, and was best-known during the late 1960s and early 1970s for popularizing the hits “Up, Up and Away”, “Wedding Bell Blues”, “Stoned Soul Picnic”, “One Less Bell to Answer”, “(Last Night) I Didn’t Get to Sleep at All”, and “Aquarius/Let the Sunshine In”, as well as The Magic Garden LP. The five original members were Billy Davis, Jr., Florence LaRue, Marilyn McCoo, Lamonte McLemore, and Ron Townson but the only members who remained constant during the band’s long career were Florence LaRue and Lamonte McLemore. They have recorded for several different labels over their long careers. Their first work appeared on the Soul City label, which was started by Imperial Records/United Artists Records recording artist Johnny Rivers. The group would later record for Bell/Arista Records, ABC Records, and Motown Records. 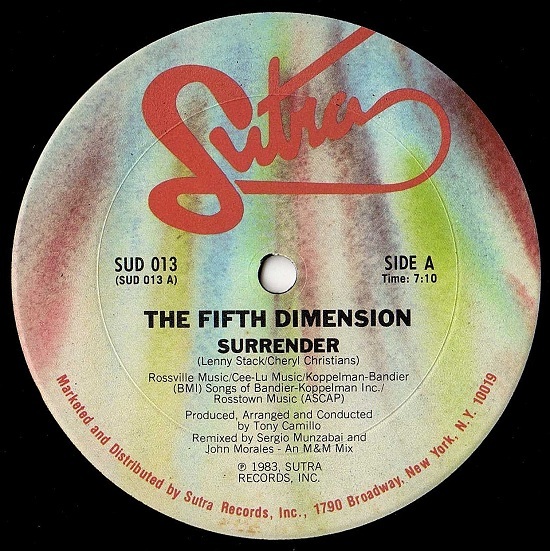 In 1983, the band released it’s first single in five years, “Surrender” was released on the Sutra label and was written by Lenny Stack and Cheryl Christensen, who had written “Sweet Surrender” for Diana Ross in 1981, interestingly songwriting is credited to Ashford & Simpson on the non-US releases of the single.